my brain is very scattered this week and thus, my blog post shall be too. how come i always find the most comfortable position AFTER my alarm rings in the morning? if i wasn’t me, i’d like to be carrie underwood. i got my first squash win on wednesday (9-8) and then proceeded to get squashed on every other game. but hey, i finally won one, that’s what’s important here, isn’t it? if i wasn’t in this state, i’d like to be on a beach, under a tree, slathered in sunscreen, reading a book. the antivirus program on my laptop had run through its trial program, so i needed to update or download another trial or do something so my poor laptop was not running naked through the interwebs. i couldn’t figure out how i had downloaded a trial version but anyways, after 3 hours and lots of mad googling, i finally figured it out. it involved a lot of clicking and uninstalling and reinstalling and downloading and clicking. i don’t actually know what worked, but i do know i’m not afraid to touch my laptop for fear it is contagious. if i didn’t work here, i’d like to be a professional athlete. i wish this chair came in adult size. think of the possibilities. if i didn’t live at this apartment, i’d like to be in one with a washer/dryer and a porch. i don’t recommend listening to the audiobook of gayle forman’s IF I STAY while driving, unless you’ve invented some form of windshield wipers for your eyes. i recently received some bookmarks from carrie harris. they are full of the awesome. it’s not surprising really because take a look at her website. yeah, amazing! 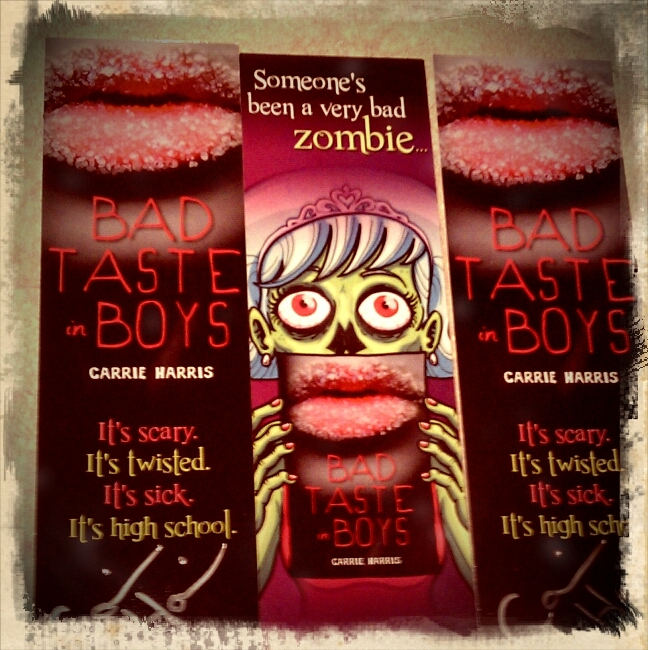 why oh why do i have to wait until July 12, 2011 for her book (BAD TASTE IN BOYS) to be released? coffee (caffeinated and decaf) makes me feel sick. i couldn’t seem to pinpoint when it would affect me and when it wouldn’t, so i made the tragic decision to cut it out of my life. i was good for about 10 months, but then i went to italy. they make espresso like no other. SLURP. and i felt fine. so i came back stateside thinking i was cured. alas, i felt sick again. drat. off it again. then i went to colorado and my mom makes really good decaf so i drank some there. fine. and then over thanksgiving, i drank more of the mom-made coffee. YUM. and i felt fine. WHAT GIVES, body? why do you only accept caffeinated when traveling? from my spam filter: “makes me want to drink alcoholic beverages” in response to the art of listening. i’m going to guess that this person is NOT a good listener. another goodie from the spam box: “People go en masse to the movies to see tales about Narnia and Harry Potter, escapist fantasies that take us away from our real world of austerity, cuts and looming economic disaster. In these tales, on our side we have wizards both brave and powerful. In real life, we look upon our so-called leaders and despair. If we want there to be a Narnia to escape to, we must build it here. Ourselves.” this comment makes no sense in response to gangsta but hey, spam is as spam does. i’m not going to unleash it from the filter, but i figured posting it here might inspire a little healthy competition. i know my commenters can get a little more creative. GAME ON. This entry was posted on December 3, 2010 at 8:00 am and is filed under general. You can follow any responses to this entry through the RSS 2.0 feed. You can leave a response, or trackback from your own site. that chair cracks me up like no other, and Baby Mac sure loves it! so do her parents. it’s the most convenient thing which is why i want one for myself. no room at the bar? no problem. while i clamp my chair onto the bar, could you pour me a guinness please, bartender? you crack me up. i love stream-of-consciousness posts! i think you should do a whole post on the “if I weren’t” theme — those are fun! congrats on the squash win! may there be many more. those bookmarks look awesome! do you want me to call you so you can listen to your phone carol (carol can be a verb, right?)? this post actually started out as all of the “if i weren’t” statements, but then i thought it had too negative of a theme, so i mixed them up with other thoughts from my brain and VOILA, today’s post. and actually, no one has called me since i switched my ring tone. I HAVE NO FRIENDS, well, specifically, no friends who call cause they’re cool kids who text. when i said you should call me, that wasn’t giving you permission to prank call me. although, can it really be considered a crank call when a christmas carol is playing? it’s too sweet to be mean. you’re off the hook, kirilova. We had a chair just like that for our kiddos–it was great for taking with us to the grandparents’ and out to restaurants. Compact and easy to carry, and the kids loved being right at the table with us. i know. i’ve heard this chair is not a new invention, so i’m surprised i had never seen it before now. 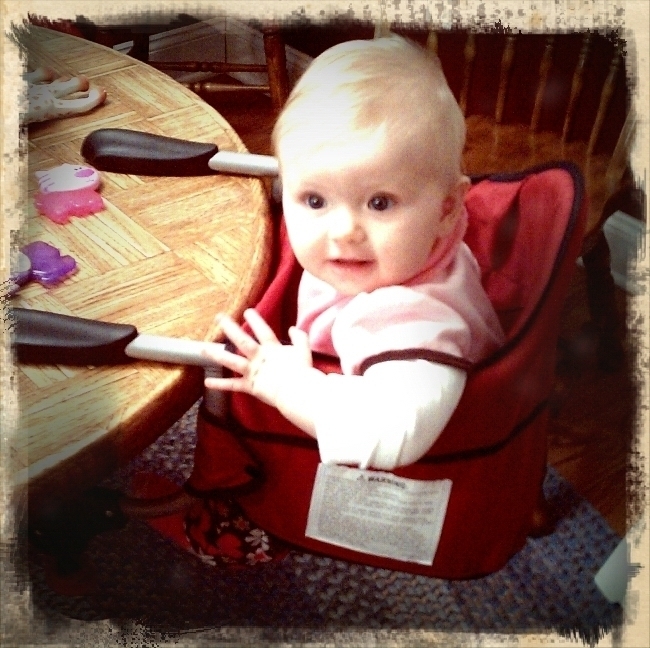 it is awesome how she can sit at the table with us banging her rattles and causing a commotion. i can’t get enough! You don’t have a copy of the picture because it’s from my phone and I don’t know how to get it from my phone to the computer… wait. I did just that to get it on this post. I’ll email it to you. who knew stream of consciousness was genetic? looks like I have yet another thing to thank you for: brain randomness. Thanks, Mom!